Currently running with DWS 06 on my '13 GL550. Need to replace soon. Has anybody tried the new Michelin 295/40 R21? How do they compare to conti? I'm thinking about getting the DWS06, any reason for changing? So Michelin has a 21" option now? Still would like to hear if anybody has tried the new Michelin 21" and how do they compare to Conti. I'm about due for new tires and will definitely be putting the Michelins on. I've had GL's for 10 years now and have gone through many sets of Contis. Ready for a change. Keep us posted to those that have changed over to Michelins. I hear mix reviews on both Contis DSW06 and Michelins PS A/S3+ but not for GL\GLS use. I'm currently using Contis Cross Contact UHP and they seem to perform pretty well (Dry and Wet) and road noise is minimal but I'm not too happy about their longevity on the GL (W420), I do rotate them every 5k. I just put a set of the Michelin Pilot Sport A/S 3+ on the wife’s GL this weekend at Costco and will update periodically as we get a few miles on theme. Costco is running a special wth $70 off plus $0.01 installation. $1461 out the door but will need to have the local MB dealer do an alignment sometime this month. Pretty sure that twin screw V8 under the hood qualifies it as a 550. Put A/S 3's on my GL350 (20" wheels). They had about 30k miles when I traded it. Still had 7/32 tread remaining. Good performance from a good tire. Recently put the A/S 3 on my X5 with staggered 20's and they are much improved over the Perilli Run Flats. Can't speak for the 21" version. I've had DWS in the past with good performance but the Michelins are better and last longer. I can’t believe I did it, but I put Pirelli Scorpion winter tires on my GL550, and so far I like them a lot. I had DWS06 before, and liked them too. Yes the A/S 3 plus are awesome! Reviews beat the conti. Nothing rides as good as a Michelin. Took our 2015 GL550 in for its "fourth birthday" service and our service advisor demonstrated excessive wear and scalloped edges, which explains the 'rumbling' and 'warbling' we hear. So, we're facing a third set of tires ... at less than 25,000 miles ... the first set lasted 13,000. Continentals ride nice at first, but don't last long ... and it gets ugly at the end as you can hear them. That's a very short life, where you able to use Contis warranty? The odd part is the DWS06 have a slightly higher tire wear (560) while the Michelins are rated at 500. I wonder the longevity of the Michelins on the GL since she's a big gal. Can't speak to that size, but I just got the AS3+ installed on my W211 E55 and noticed a huge improvement in ride quality, balance, and traction. They replaced an older set of Sumitomo HRZII, extreme summer tires. Arguably, not the best extreme summer tire, but the AS3+ were a big improvement even on grip and they are classified as a A/S tire. I've spoken with others that have gone from the DSW06 and unanimously, a BIG improvement. The Contis hold an edge on wintery driving and wear, but that is it. I was satisfied that the dealership split the cost with me, i.e., two of the four tires were free. They may have gone back to Continental under warranty! 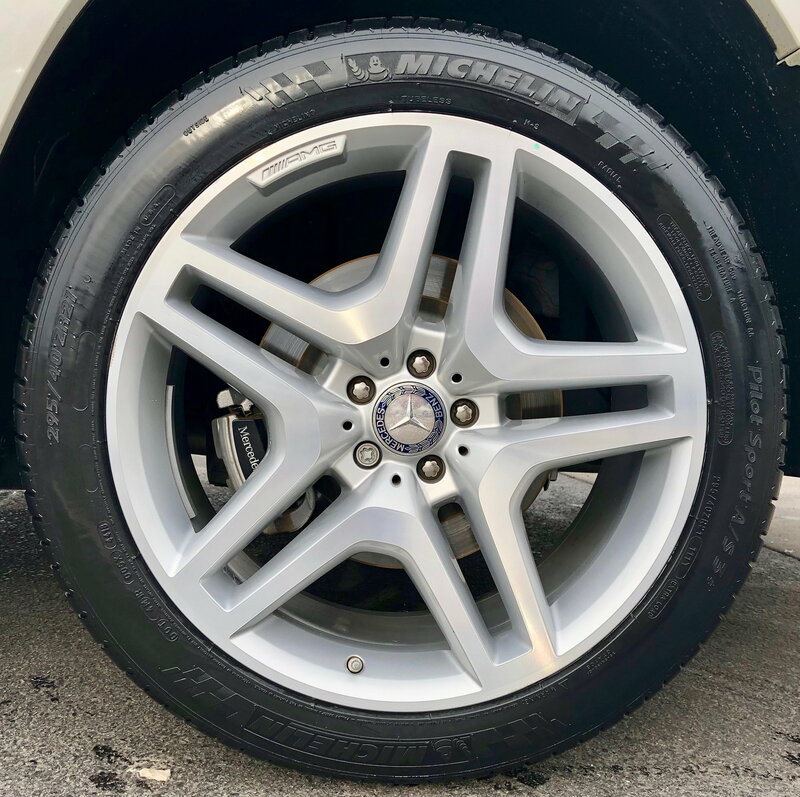 I won't expect great mileage from any tire as the GL550 is hard on all tires, but 13,000 on the first set and only 11,000 on the second set is ridiculous. Hoping to get better with Michelins. I just want to say it again. I've had MANY cars, and many tires. When my local dealer and local tire shop has an issue with a car not riding smooth, or a slight shimmy they can't fix, they always change to MICHELIN. It usually fixes the issue. No tire rides as good. They are always more, but it's worth it. In reality the A/S 3's aren't always more $$. Some Pirelli and Conti tires cost more and are not as good. I've had tires from Bridgestone, Conti, Pirelli and Michelin on a variety of German brands and the Michelins are by far the best followed by Pirelli, then Conti. And you should be happy to know Lamborghini guys only want Michelin on their cars, due to the ride quality. Have some good friends and they all swap them out for Michelins. Started with our new Michelins at the minimum recommended cold tire pressure of 32 PSI in all tires. Ride was smooth and quiet, but a bit 'wobbly' ... especially on uneven secondary roads, but great on smooth primary roads. Both drivers felt the need for higher tire pressure for greater control so will increase it to 35 PSI in all tires and try again.